1,000 IU - High Potency Helps Maintain Strong Bones Supports Dental Health* NOW® Vitamin D-1000 softgels supply recommended levels of this key vitamin in a highly-absorbable liquid softgel form. Vitamin D is normally obtained from the diet or produced by the skin from the ultraviolet energy of the sun. However, it is not abundant in food. As more people avoid sun exposure, Vitamin D supplementation becomes even more necessary to ensure that your body receives an adequate supply. Supplement Facts Serving Size: 1 Softgel Servings Per Container: 360 Description Amount per Serving % Daily Value * Percent Daily Values are based on 2,000 calorie diet.† Daily Value not established. 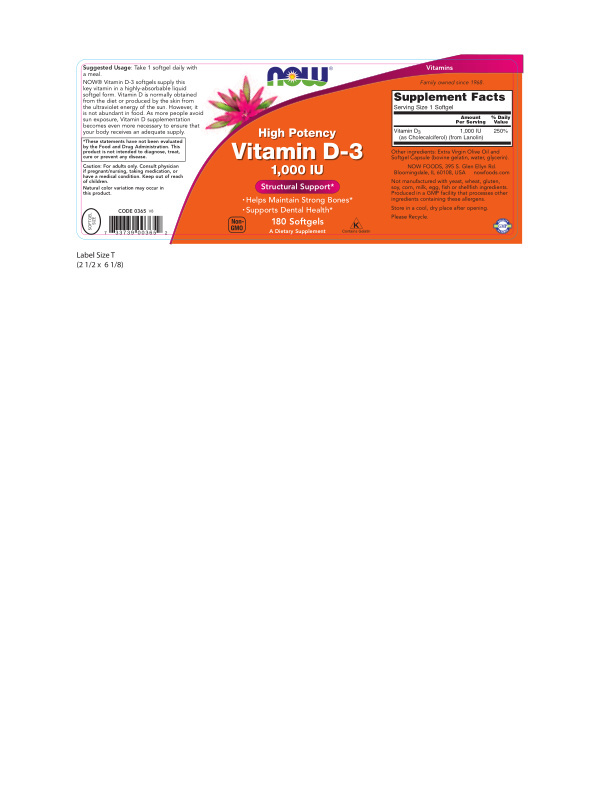 Vitamin D3 (as Cholecalciferol) (from Lanolin) 1,000 IU 250% Other Ingredients: Olive Oil and Softgel Capsule (gelatin, glycerin, water). Contains no: sugar, salt, starch, yeast, wheat, gluten, soy, milk, egg, shellfish or preservatives. Store in a cool, dry place. Please Recycle. *These statements have not been evaluated by the Food and Drug Administration. This product is not intended to diagnose, treat, cure or prevent any disease.